Cleco Pneumatic Stall 55 Series Reversible Angle Nutrunners feature a lever start and twist ring reverse. Cleco Pneumatic Stall 55 Series Reversible Angle Nutrunners have a heavy duty Cleco motor which is the industry standard for reliability. Cleco Pneumatic Stall 55 Series Reversible Angle Nutrunners are engineered for performance, durability, mounting versatility, and serviceability. Cleco Pneumatic Stall 55 Series Reversible Angle Nutrunners feature planetary gears designed for tool speed changes with minimal parts service and replacement. Cleco Pneumatic Stall 55 Series Reversible Angle Nutrunners also feature heavy duty spindle bearings and splined retractable spindles that reduce friction, improves torque repeatability, and prolongs life. 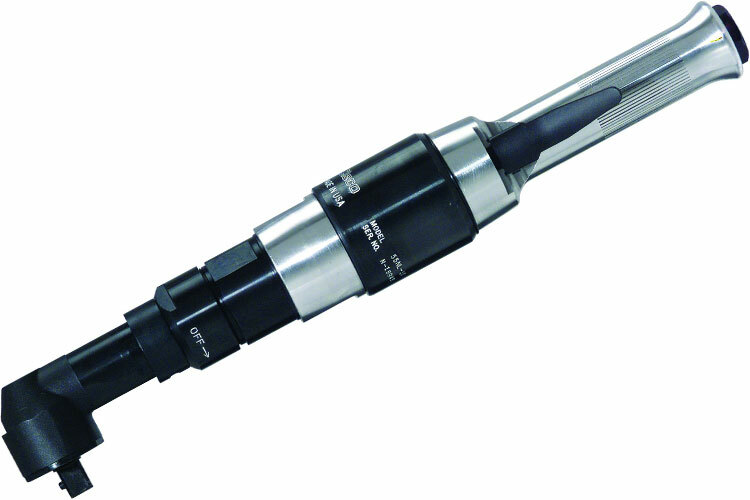 The 55RNL-2T-4 Cleco Pneumatic Stall 55 Series Reversible Angle Nutrunner, 1/2'' Square Drive is one of thousands of quality tooling products available from MRO Tools. Please browse Cleco Pneumatic Stall 55 Series Reversible Angle Nutrunners for tools similar to the 55RNL-2T-4 Cleco Pneumatic Stall 55 Series Reversible Angle Nutrunner, 1/2'' Square Drive. 55RNL-2T-4 Cleco Pneumatic Stall 55 Series Reversible Angle Nutrunner, 1/2'' Square Drive description summary: Cleco Pneumatic Stall 55 Series Reversible Angle Nutrunner Square Drive: 1/2'' Max Torque: 130ft-lbs. / 176Nm Free Speed (rpm): 145 Overall Length: 16.8'' / 425mm Weight: 6.5lbs / 2.9kg Head Height: 2.0'' / 50mm Side to Center: 0.9'' / 22mm Quantity discounts may be available for the 55RNL-2T-4 Cleco Pneumatic Stall 55 Series Reversible Angle Nutrunner, 1/2'' Square Drive. Please contact MRO Tools for details.